Peeling, cracking, flaking indoor paint sometimes signals an unseen leak. Other times, it's merely an eyesore. But in any event, you can undo the damage, without having to repaint the whole room. Read on to learn how. If you painted an interior wall not too long ago but have noticed that it’s already peeling, cracking, or flaking, here’s what to do. First, check for any leaks that may be causing the problem. If leaks are to blame and you don’t address those first, then there’s no point in worrying about your paint job. Once you’re sure that leaks are not, or are no longer, an issue, you can get down to business. Start by spreading a drop cloth on the floor. After that, slip on a dust mask and safety googles. Now it’s safe to begin scraping away the eyesore paint with a scraper or putty knife. 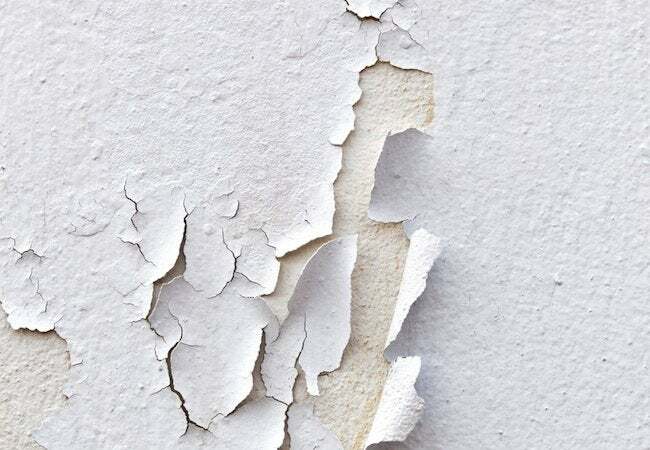 With the wall stripped of peeling, cracking, or flaking paint, prep the wall for the next stage of work by applying a quick-setting patch compound. Apply a thin, even layer that fills in any cracks or holes. Note: Some areas may need a second coat after the first one has dried. Leave the compound overnight to fully cure. In the morning, smooth the patched area with fine grit sandpaper until it blends with the rest of the wall. To make sure you didn’t miss any spots, lightly run your fingertips over the patch, feeling for any unevenness. Finally, clean the wall surface with a damp sponge, wipe it dry, and then—once it’s completely dry—you may apply a coat of oil-based, stain-blocking primer. Wait at least a few hours. Once the primer’s dry, you’re ready to retouch. Start inside the patched areas and feather the paint outward. You’ll most likely get better results with multiple, thin coats of paint instead of one thicker coat.